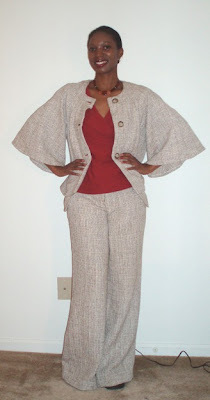 With the Butterick 5101 top finished, these are my combos so far. You look great! All your garments look good!! You’ve done a lot of work since I first saw the slacks. Great Job!! First can I say that I like your hair! Second your SWAP is coming along swimmingly…it is so kewl the way each piece is playing so nicely with the others! Thanks, gals, for your comments. Yes, coolobreeze, I trimmed my hair about a week ago. It really needed it! You look fantastic! !You did a good job!All that work was worth it.